The idea behind the Mini originated in the mid 1950's and stemmed from a desire of the then head of BMC, Leonard lord, to add a small economical but practical car to his Austin & Morris ranges. Due to the Suez crisis (fuel was becoming expensive) small frugal cars were becoming increasingly popular. He appointed the task of designing the new car to one man - Sir Alec Issigonis, who had previously designed the very popular Morris Minor that had been launched in 1948. Issigonis came up with a radical design, in which the 848cc version of the BMC A series engine was mounted transversely across the front of the car, with the four-speed manual gearbox effectively housed in the engines sump casting. This of course made incredibly good use of space and the end result was a car that was only 10 feet long, 4 feet 7 inches wide, and yet could hold four adults and their luggage. The Mini was also blessed with extremely good roadholding and handling, with its front wheel drive layout, rack and pinion steering, and independent suspension. 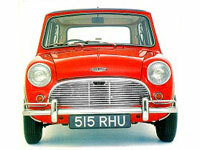 The Mini was originally launched in august 1959 as the Austin Seven (or se7en) and the Morris Mini Minor. The general public met its new revolutionary design with caution, but within a short space of time the Mini had become a car that held great appeal to many, and was the worlds first truly classless vehicle, being bought by people form all walks of life including many celebrities. Among it famous owners were Cliff Richard, The Beatles, Twiggy and Peter sellers. It is interesting to think that even though Issigonis knew that the car he had designed had great potential, I doubt he could have ever imagined that he had created possibly the greatest motoring legend of the 20th century. This first Mini Cooper was launched in July 1961. It had been developed by the designer of the original Mini Sir Alec Issigonis, with racing driver and engineer John Cooper. The Cooper S was launched in April 1963 as a higher performance version of the standard Cooper on which it was based. This first Mini was launched in August 1959, and was available as a Morris (Morris Mini Minor), or as an Austin (Austin seven).